By Aswin Kumar, D.O., Andrew Teh, D.O., Alysha Vartevan, D.O. 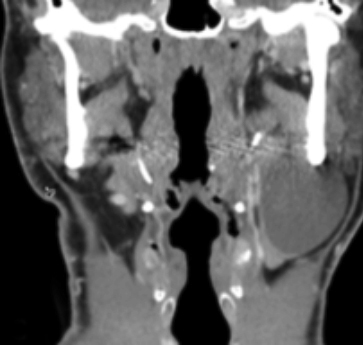 A 34-year-old man presented with worsening neck pain and an enlarging neck mass. Physical examination demonstrated a palpable left neck mass that was tender to palpation with overlying skin erythema; a contrast-enhanced neck CT was performed (Figure 1). Cystic neck masses are commonly encountered in imaging practices and can result from a variety of entities, both benign and malignant. The most important factors in diagnosing cystic neck masses are a thorough history and physical, as the clinical presentation and patient age often determine the differential diagnosis. Diagnostic imaging provides anatomic characterization and assessment of potential complications, and aids in management and treatment planning. Common congenital cystic neck masses include thyroglossal duct cysts, branchial cleft anomalies, and lymphatic malformations. Acquired cyst-like lesions include abscesses, cystic nodal metastasis, and neurogenic tumors.2 For the purpose of this article, the discussion will be limited to cystic nodal metastasis, abscesses, and branchial cleft cysts. On CT, branchial cleft cysts appear as nonenhancing, sharply marginated, hypoattenuating masses with thin walls. Wall thickness may increase in the event of secondary infection. In the less common Bailey type III second branchial cleft cyst, a thin rim of tissue may point medially between the internal and external carotid arteries, which is referred to as a “beak sign.”1-2 On US, branchial cleft cysts commonly appear as well-circumscribed, compressible, anechoic masses with posterior acoustic enhancement and thin walls. Peripheral vascularity with mural thickening may be appreciated with superimposed infection. =Cystic masses of the neck are commonly encountered in imaging practices and may be benign or malignant in etiology. Patient demographics and clinical presentation in conjunction with imaging findings play a key role in developing differential diagnoses, assessing for complications, and guiding treatment and management of these lesions. 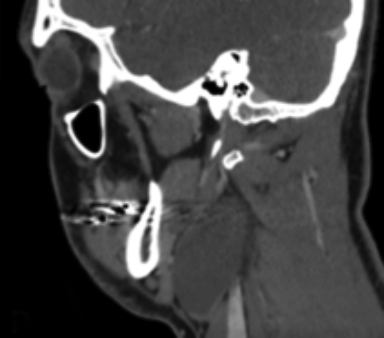 In our 34-year-old patient, the imaging characteristics supported the diagnosis of a Bailey type II second branchial cleft cyst, which was confirmed upon surgical excision. Koeller K, Alamo L, Adair C, et al. Congenital cystic masses of the neck: radiologic-pathologic correlation. RadioGraphics 1999;19(1):121-146. Mittal M, Malik A, Sureka B, et al. Cystic masses of neck: a pictorial review. Indian J Radiol Imaging 2012;22(4):334-343. Granström G, Edström S. The relationship between cervical cysts and tonsillar carcinoma in adults. J Oral Maxillofac Surg 1989;47(1):16-20. Wunderbaldinger P, Harisinghani M, Hahn P, et al. Cystic lymph node metastases in papillary thyroid carcinoma. Am J Roentgenol 2002;178(3):693-697. McKellop J, Bou-Assaly W, Mukherji S. Emergency head & neck imaging: infections and inflammatory processes. Neuroimaging Clin N Am 2010;20(4):651-661. Benson M, Dalen K, Mancuso A, et al. Congenital anomalies of the branchial apparatus: embryology and pathologic anatomy. RadioGraphics 1992;12(5):943-960. Bailey H. Branchial cysts, and other essays on surgical subjects in the facio-cervical region. Brit J Surg 1929;17:362. 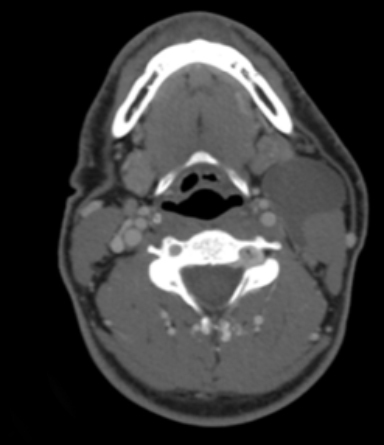 Kumar A, Teh A, Vartevan A. Cystic Neck Mass. J Am Osteopath Coll Radiol. 2018;7(4):5-10.